Monday, July 30 to Sunday, September 3, 2017. Because I would prefer that you perceive the time that you invest in reading these posts as time also usefully spent, allow me to start with a visual exposition of the pleasantly straight-forward geometry of parallel parking. In an astonishingly fortunate confluence of events, I ended up again in my other home country. Although time was short, business was executed, and a great deal of highly concentrated joy was artfully squeezed from every minute. Thank you Dutch family. I hope to see you again soon! Back home, it was time for me to add another life year to my steadily growing collection. My gracious employer thought that the big day was an as good moment as any to equip me with a brand new work machine. Up to then, I had been working on all of three different machines: Linux-running i7 desktop (acquired in Feb of 2015), early 2015 13″ retina MacBook Pro (acquired in June of 2015) and my trusty old klunky i7 Acer Linux-running laptop (acquired around March 2013). Data is kept in sync, but context switching between different projects with different development environments on different machines at home and at work does seem to take up more time than I would care to admit. Having everything on a single powerful-enough laptop would indeed make the most sense from a time-efficiency perspective. I’m typing on the thing now. The keyboard’s second-generation butterfly switches do take a little getting used to, but I believe I may have been converted. Importantly, I’ve already started seeing the advantages of always having all my work (and all my computer-based hobby-related toys) with me. No more context-switching means more time available for what happens between the switches. On the topic of time efficiency, in an attempt to better understand what I was doing with my free time, and how exactly I was spending time at work, I put in some extra effort to record more accurately every minute of my time awake. I dream about being able to squeeze out more value from each day by being able to measure and review. This is an extension to establishing a cadence of accountability for deep work, where one looks not only at deep work performed, but general value contributed and derived. Watching SNL or College Humor clips on YouTube is fun, but can’t really be considered high value. In terms of R&R, reading a book, writing a blog post, learning something new and spending time with your family are all of high value. Recording time like this does seem ever so slightly OCDish, but it was really for science, and mostly for evolution (see rule #3 of WHV’s Two Rules for Achieving Great Success in Life, or Just Surviving, Whichever Comes First). I did only manage to keep it up for slightly over two weeks. What was interesting, was that the act of having to specify and record each block of time forced me to be much more deliberate about everything I did. All of a sudden, even goofing off could only happen if I explicitly spent time deciding that goofing off was really justified. Furthermore, the fact that I knew exactly how many minutes I was goofing off, tended to keep these distractions short. The problem with this experiment quite unsurprisingly turned out to be the overhead of mechanically having to record every minute. That being said, I think the availability of a practical, highly private and practical mechanism (unlike the one I tried) for the real-time and aggregated measurement and reporting of “time value” could be a substantial help in the continuous optimisation of one’s days. On the topic of quality of life, I recently read The Subtle Art of Not Giving a F*ck: A Counterintuitive Approach to Living a Good Life by Mark Manson. I was involuntarily eye-rolling quite regularly through the first 3⁄4 of the book, but by that time either Manson had just worn me down, or his writing had in fact greatly improved. Whatever the case may be, I think the message is an important one, especially for young(er) people: You’re not special, so make peace with that as soon as you can. Accept that life is really just a series of problems that you have to solve, so at least pick the interesting ones. You probably won’t ever be happy or content for more than a few moments (sounds familiar, doesn’t it?) because that’s quite logically been evolved out of us. Pick the few things that you really care about, and commit to them. The opposite of every other book. Don’t try. Give up. Be wrong. Lower your standards. Stop believing in yourself. Follow the pain. Each point is profoundly true, useful, and more powerful than the usual positivity. Succinct but surprisingly deep, I read it in one night. On the topic of not being special, I recently stumbled upon this interview with Simon Sinek. It’s all about the phenomenon of millenials in the workplace. Many of us around here (hey, we read long form blogs, this means we’re probably old-school) don’t classify as millenials, but the points Sinek makes about the role of old-school patience and focus in the work-place as opposed to the millenial-era instant gratification attention economy resonated with me. It would be remiss of me not to mention Wait but Why’s brilliant and complementary exposition of Why Generation Y Yuppies Are Unhappy. Whatever shall we do with this information? We’re not special (phew, that’s a weight off one’s shoulders! ), and we can’t ever attain more than fleeting happiness or contentment. What we can do is to make peace, and to savour with wide open senses the fractal infinity hidden in the moments that we are blessed with. P.S. Buddha also had a number of great tips. P.P.S. During the night I started worrying that readers, especially my mom (hi mom! ), might think that I’m unhappy, and that this post is a cry for help. I would like to assure you all that I’m currently enjoying life more than ever before, at least as far as my failing old memory is concerned. I can personally vouch for the making-peace-and-savouring-moments approach. P.P.P.S. 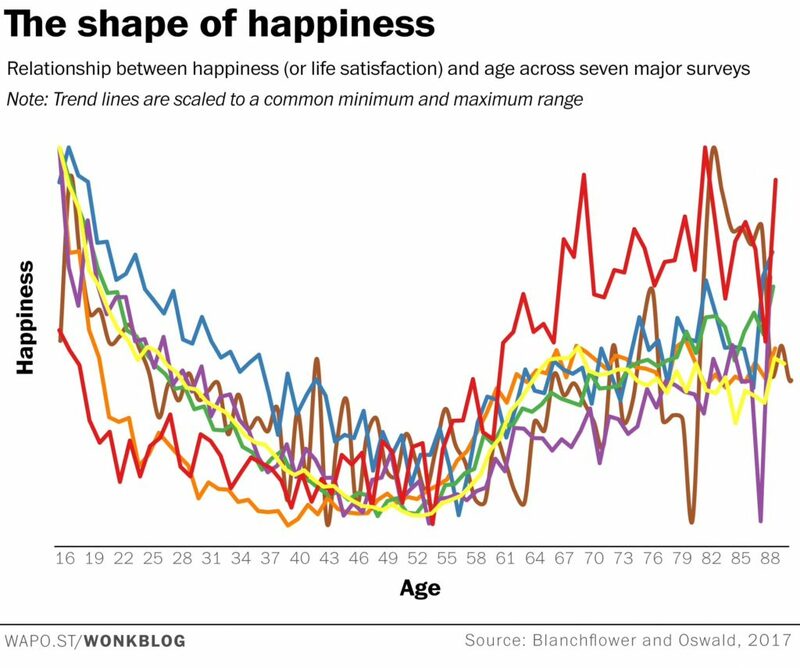 Statistically, humans hit happiness rock bottom at around about 50, see the u-shaped graph below (thanks FM for sending). A number of us are hiding here in the we’ve-made-our-peace-thanks-for-all-the-fish long tails of the distribution, where we plan to ride this one out. Join us! < The 2017 to 2018 transition post.